Deborah Maccoby, The Jewish Chronicle and a Smoked Salmon Beigel. Is it Friday already? In his Holocaust Education Trust dinner speech (The scourge of antisemitism is changing form, JC, October 20 2017) Andrew Neil erroneously cited the Free Speech on Israel fringe meeting at the Labour Party Conference: “the chair of the meeting asked: ‘We demand the right to debate ‘Holocaust: yes or no’”. The chair of the meeting, Naomi Wimborne-Idrissi, made no mention of the Holocaust. The guest speaker, Miko Peled, an Israeli-American who is not a member of the Labour Party, said: “This is about free speech, the freedom to criticise and to discuss every issue, whether it’s the Holocaust: yes or no, Palestine, the liberation, the whole spectrum. There should be no limits on the discussion”. 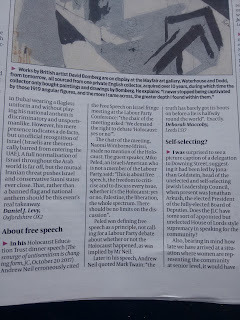 Peled was defining free speech as a principle, not calling for a Labour Party debate about whether or not the Holocaust happened, as was implied by Mr Neil. Later in his speech, Andrew Neil quoted Mark Twain: “the truth has barely got its boots on before a lie is halfway round the world”. Exactly. Apparently what happens at the JC is, on Thursday night the JC print editions get delivered to shops and houses up and down the country. The date on it is the Friday not the Thursday. The letters are then loaded onto the website on the Friday bearing that Friday's date and the letters which by now then have all appeared in the print edition. Well Deborah Maccoby's letter was reproduced in error on the website before it has appeared in print. Now it is possible that someone at the JC wanted it printed while someone else wanted it pulled but let's just assume that the JC did intend to publish it in today's print edition but published in error on line last week then pulled it and now is pushing it again. Sorry, I'm not very good at that edit malarkey but well done to the JC for publishing a letter completely out of kilter with their standard Zionist fare. Is Corbyn Embarrassing Corbyn or the Zionist "Glitterati"? 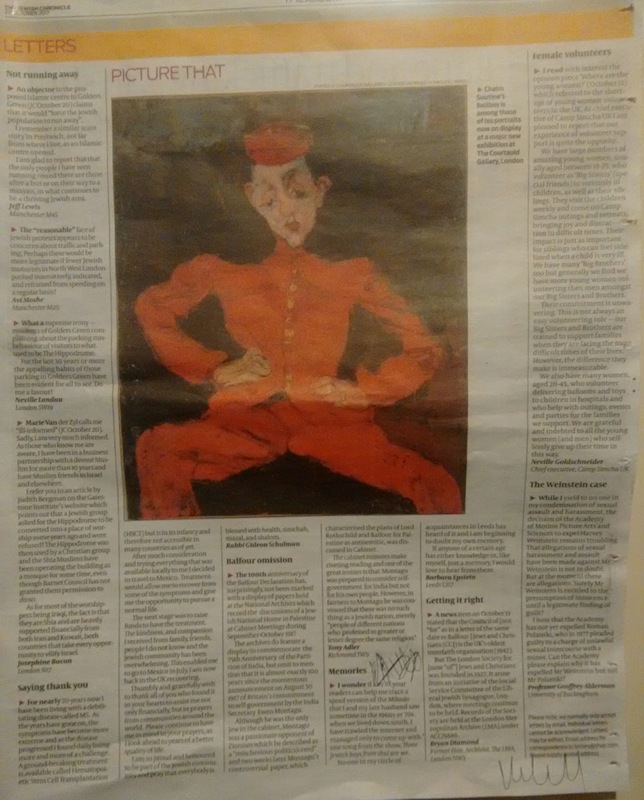 I just noticed a Marcus Dysch article in the print edition of the Jewish Chronicle headlined, "Yet again, Corbyn has embarrassed himself". I googled those very words out of quotes to see if the piece is on line and, yes, it is. Here's the search, Yet again, Corbyn has embarrassed himself. And top of the list is Dysch's article. It's a gripe about Jeremy Corbyn refusing to attend the Balfour Declaration celebratory dinner. It was, of course, an open secret among communal leaders that Jeremy Corbyn was unlikely to accept their invitation to next week’s gala Balfour Declaration centenary dinner. The Labour leader, with decades of anti-Israel campaigning under his belt, was never going to sit alongside the country’s glitterati — its political, social, religious, diplomatic and charity leaders — for the slap-up meal. When the invitations went out, I was told by a senior Jewish Leadership Council figure that no pressure would be put on Mr Corbyn to turn up, nor would a fuss be made if he declined. After the past two years of trials and tribulations between the Labour chief and the community, there was no desire to cause embarrassment, or a major row, on either side. As my source predicted, Emily Thornberry will represent Labour, although the Leader of the Opposition’s office failed to live up to the other part of the prophecy and blame a diary clash, offering instead no explanation for his absence. So there was a muted response beyond Jonathan Goldstein saying it was “deeply unfortunate” and Hamas welcoming the news. Let’s be honest, few friends of Israel will have wanted Mr Corbyn there. But it is the principle that counts. Ms Thornberry filling in for Mr Corbyn at a Labour Friends of Israel reception at the party conference last month brought ridicule on them both when she claimed he was preparing for his speech but everyone knew he was out partying. For the Labour leader now to avoid this major event sends another clear message, and shames his party. If Mr Corbyn wants to be Prime Minister, he needs first to learn how to be a statesman. The great offices of our nation demand more than former backbenchers still clinging to personal grievances. What's noticeable about the piece is the sheer arrogance it oozes. The "country's glitterati" are to celebrate handing Palestine on a platter to the Zionist movement. Seniors of the Jewish Leadershio Council decided, "no pressure would be put on Mr Corbyn to turn up, nor would a fuss be made if he declined." Well that's very big of the big wigs and Mr Corbyn didn't even have the decency to invent an excuse for refusing to celebrate the UK's and Israel's imperial past and present. But the google search threw up other finds too including the words Corbyn and something with embarrass as its root. A debate between Corbyn and Owen Smith in the second Labour leadership contest had a LabourList article asking, Was Corbyn "an embarrassment" or did he carry himself "with dignity"? Of course we now know he carried himself with enough dignity to win the contest. That was last year, 2016. The next article in the search with the word "embarrassment" in it was one in the Telegraph. The word "embarrassment" used regarding his wife's coffee business. Nothing to do with him and anyway, that was back in 2015. Next up we have Huffington Post finding "Ex-Jeremy Corbyn Supporters" who "Are 'Embarrassed' They Voted For Him". That was before the second leadership bid. 2016 again. I wonder how embarrassed they are now he came close to winning the general election this year. The list on the google page goes on. 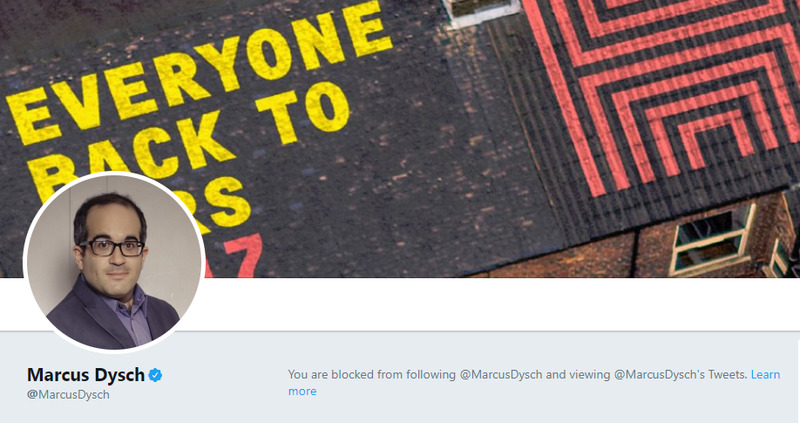 The fact is, Marcus Dysch's arrogance is misplaced. Corbyn has not embarrassed himself at all. He has shown himself to be in a position to embarrass the Zionist movement which is precisely why these Zionist "glitterati" aren't making a fuss about the second slap in the face Corbyn has dealt them since refusing to attend a Labour Friends of Israel rally at the recent Labour Party Conference 2017 in Brighton. So is Corbyn embarrassing Corbyn or is Corbyn embarrassing the Zionist "glitteratti" You might want to ask or tell Marcus Dysch of the Jewish Chronicle. I can't ask or tell him on Twitter because he's blocked me. If you read my previous post, you'll know the basic plot. 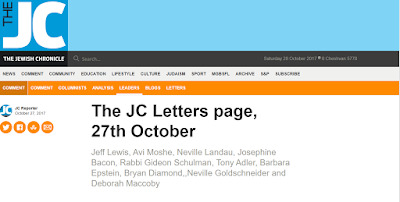 The Jewish Chronicle published on its website a crop of letters from the print edition. As it happens, I can now see the plot - which was in my mind mostly - unravelling as I write this. Well they listed the correspondents in the sub-heading and printed out the letters, including one from Deborah Maccoby. Well, the next day on the same page, Deborah's name had gone from the sub-heading and so had her letter from the page. The letter went up online this week too early. If you look at the hard copy of the paper, it's not in there - bec it is running this week. What that meant was that the print edition of the JC which most people get on Friday carried all the letters published on line on that day, 27 October 2017, but not Deborah's. Deborah's local JC stockist didn't get their copies on Friday and she still hasn't seen it. "My" copy is a typical JC and it passes through many family member hands before it reaches my pair. In fact, I was reduced to buying the blooming thing for the first time since my mother died last year. Look at the blurry pic I just took. See the names of the correspondents? Jeff Lewis, Avi Moshe, Neville Landau, Josephine Bacon, Rabbi Gideon Schulman, Tony Adler, Barbara Epstein, Bryan Diamond, Neville Goldschneider and Deborah Maccoby. See the names? Jeff Lewis, Avi Moshe, Neville Landau, Josephine Bacon, Rabbi Gideon Schulman, Tony Adler, Barbara Epstein, Bryan Diamond and Neville Goldschneider. Now this chimes with what the JC said in their tweet. You see? Deborah Maccoby's letter wasn't published in Friday's print edition. But scroll back up and see Professor Geoffrey Alderman in the print edition but not the webpage. More mystery. What happened to the Professor? But back to Deborah. According to Deborah, she sent the letter in good time for publication in last Friday's edition so if it was going to be published she would have expected it to be published then. 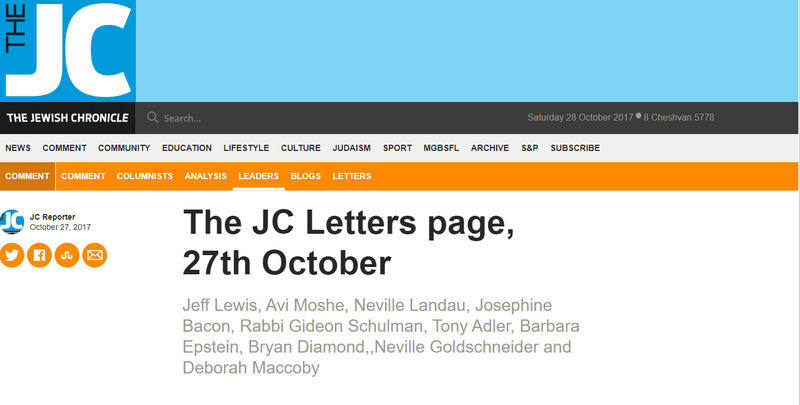 Now the JC, via its tweet, seems to saying that her letter is going to be in this Friday's edition. Before I saw the last print edition today I had assumed Deborah's letter was in that one. So now, if the JC, is saying that Deborah's letter is pegged to go into the edition of Friday 3 November we can expect to see the letter in print on that day and on line on the same day. In his Holocaust Education Trust dinner speech ( “The scourge of antisemitism is changing form”, JC, October 20 2017) Andrew Neil erroneously cited the Free Speech on Israel fringe meeting at the Labour Party Conference: “the chair of the meeting asked: ‘We demand the right to debate ‘Holocaust: yes or no’”. “This is about free speech, the freedom to criticise and to discuss every issue, whether it’s the Holocaust: yes or no, Palestine, the liberation, the whole spectrum. There should be no limits on the discussion”. I must say, I'm still puzzled about Professor Geoffrey Alderman. Why didn't his letter appear on line? The link to the letter was here. Clicking on the link though, you will not now find the letter. Thanks to Google cache I know that you would have seen the letter if you'd have clicked the link between some time on 27 Oct 2017 and roughly "28 Oct 2017 02:46:01 GMT". But now, sadly it's gone. Obviously, scrolling down you would see the letter, which fortunately still appears in Google cache together with the link to the Andrew Neil article which Deborah was criticising. I can't help wondering if Andrew Neil (on Twitter as @afneil) asked @StephenPollard to have the letter removed. But whatever or whoever caused Deborah Maccoby's published letter to be removed from the Jewish Chronicle, thanks to Google cache and to me everyone can see the letter and everyone can see that it has been removed. Who knows? Maybe the Jewish Chronicle will restore the page to its original splendour. Ken Loach as always stood up to inequality, if the #Jews in the UK & #Israel can’t handle that, it’s their problem. I wasn't sure what to do at first. I checked the account and saw there were 4 of my mutual followers (ie I follow them and they follow me) and I alerted them by DM. Two unfollowed, the other two don't seem to check their accounts regularly. 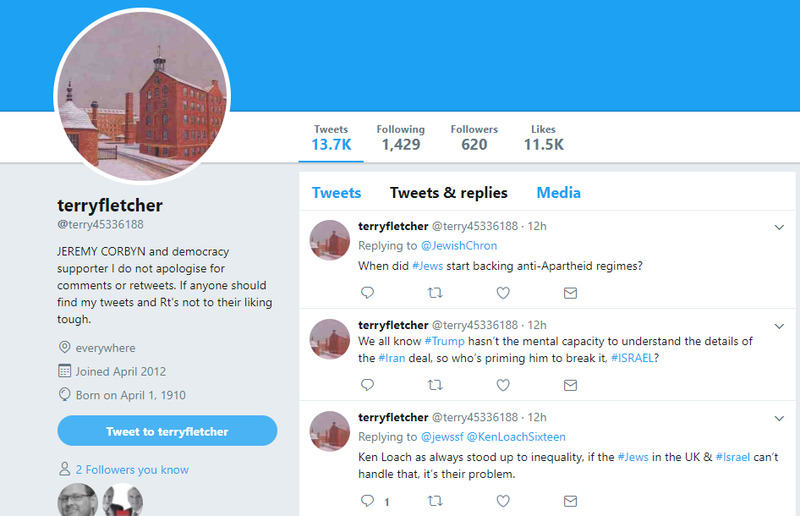 All four seem to routinely follow the accounts that follow them and this fake account only intersperses tweets with antisemitism. 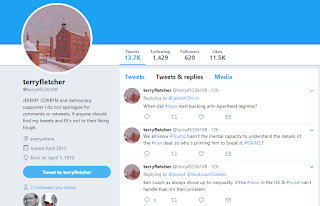 One of the people who did respond to my DM said that a lot of these bogus accounts use 8 numerics after a name as this terry45336188 did. I noticed that the account "joined April 2012". So it appears it wasn't founded specifically to undermine Corbyn but it is definitely a bogus account. Moral of the story, never just follow an account because it follows you, always scan the profile and a few tweets of an account you are liking, retweeting or following. 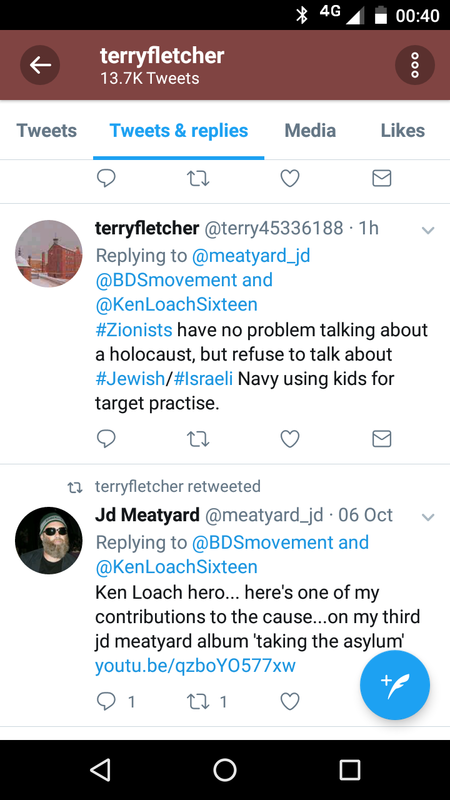 Sorry to come across as censorious but Zionists are jumping through hoops to smear their critics, opponents and victims as antisemitic. This is all they have because there is, of course, no case for Israel. Their claims are getting increasingly desperate and ludicrous but they are still space and time consuming so a little bit of due diligence can stop these time and space wasters, er, wasting time and space. N'est pas? Ken Loach has had a letter published in the New York Times refuting demonstrably false claims made about him by Howard Jacobson. We will not be intimidated. The Labour Party will continue to assert “the values of peace, universal rights and International law” as proclaimed in its manifesto. In a moment that will live in infamy, the distinguished film director Ken Loach defended questioning the Holocaust. “I think history is for all of us to discuss,” he said, dodging the question of why the Labour Party should have chosen the Holocaust, of all historical events — and not slavery, say — to subject to scrutiny. I immediately knew he was lying but I was pleased Ken Loach had another chance to answer his slanderers so I followed the link and word searched "victim". Obviously, you don't have to use the word "victim" to claim to be one. But on reading the letter and re-reading it, there was nothing there to suggest that he was claiming that he was a victim. Scroll back up. See what he wrote. Any sign of self-pity? This is a guy who supports the Palestinian cause. It's inconceivable that he would claim victim status when the only reason he's being smeared is because he supports the cause of a victimised nation. 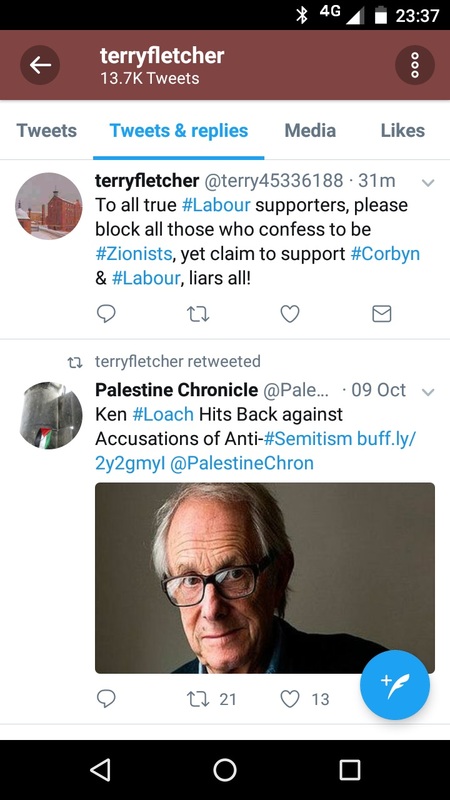 Of course, Ken Loach has been victimised but I think he has enough self-awareness to refrain from complaining about it. He was simply setting the record straight. So did he write anything at all that could be construed as claiming victimhood? Let's take it line by line. 1. Howard Jacobson alleges that I defended questioning the Holocaust. 2. I did not and do not. 3. In a confused BBC interview, where question and answer overlapped, my words were twisted to give a meaning contrary to that intended. 4. The Holocaust is as real a historical event as World War II itself and not to be challenged. 6. Exaggerated or false charges of anti-Semitism have coincided with the election of Jeremy Corbyn as leader. Nope, that's about Corbyn, not Ken. 7. Discredit his supporters, and you weaken his leadership. Again. mostly about the leadership but also about the supporters. Discrediting isn't necessarily victimising. Dave to me is an utterly discredited figure. He's hardly a victim. Now that's not a claim of victimhood, in fact it looks like Dave's job description. Ok, to the final paragraph and what have we here? 9. We will not be intimidated. What we have here is a flat contradiction of what Dave Rich is claiming Ken Loach said. What's extremely concerning is that Dave was so confident that his followers would "agree" with him, he even helpfully provided the link to the letter that he so flagrantly lied about. If you look at the tweet, look at the replies too. Last I checked I was the only one pointing out that Dave was misrepresenting what Ken Loach had said. 10. The Labour Party will continue to assert “the values of peace, universal rights and International law” as proclaimed in its manifesto. And so we see, er, nothing to see. And that is Dave Rich, one of the UK's most prominent antisemitism hunters. 2. Your allegation, made explicitly now, that Machover agrees with Heydrich's account of Nazi Jewish policy is really scandalous. And from exactly one year ago, here's Dave smearing Jonathan Rosenhead of Free Speech on Israel. whoever's responsible it's a disgrace. "Wily" Jews "fabricate" antisemitism? It is impossible to know from the outside exactly what and who have made this moral panic [the antisemitism smear campaign] go with such a swing. Key individuals may well be Jeremy Newmark, well-placed in JLM, though only just in time, to fan these flames. The wily Mark Regev took up his post as Israeli ambassador in London at the start of April. In July Ella Rose left her job as public affairs officer at the Israeli Embassy to become Director of JLM. Who knows? Organisationally, judging by their public pronouncements there is an at least informal coalition of forces involving JLM, Progress (the Blairite pressure group), and Labour Friends of Israel which have all been promoting the idea that the left is permeated with antisemitism. See that? Dave was clever here. He put the word "wily" in quotes but not the word "Jews". So he could, and did, claim that he wasn't actually misquoting. Again check out the thread. And this is Dave Rich's job and, apparently his hobby too. Dave Rich is just one player in this annoying and damaging game. He's not a particularly bright one by any means, in fact, a sure sign that Rosenhead wasn't generalising about wily Jews is that, whilst many of the merchants of smear can be justly accused of fabrication, Dave Rich and many others can never be accused of being wily. All in all Palestine had a good Labour Party Conference 2017. Naomi Wimborne-Idrissi and Leah Levane both swatted away 2 years worth of false allegations of antisemitism here and here, and Free Speech on Israel had a fringe meeting that was so successful Zionists had to stoop to falsely accusing them of Holocaust denial. The Holocaust denial thing was just one of the false allegations of antisemitism directed mostly at Jews at the conference. But one thing that marred the mostly triumphant return of Palestine to the centre of the left's (left of centre? 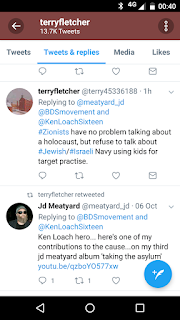 No, centre of left) consciousness and activism was the granting of the Del Singh Memorial Award to the Zionist, so-called Jewish Labour Movement (JLM), led by the notorious liar and smear merchant, Jeremy Newmark. Del Singh Foundation was created in January of 2014 immediately following Del’s tragic and untimely death in Kabul, Afghanistan while working with the British Department of International Development. Del dedicated his life to fighting for human rights across the world and sought justice for those whose voice could not be heard. He channelled his passion in to every project he was involved in, from his international development work to supporting local community projects at home. His vision, moral courage and fortitude helped Labour Friends of Palestine (LFPME), a human rights group that Del helped to found, become an organization that could champion the cause for justice for Palestine more effectively within the UK parliament. The family of a murdered Labour activist is demanding an apology from the Labour Party for having given an award named after him to the Jewish Labour Movement, saying the award should be withdrawn. The statement, which was made in the name of Dishi Kaur-Umfleet, the sister of Mr Singh, talked of the “exploitation and manipulation of… my brother’s name… disrespecting his memory and everything he stood for”. Jeremy Newmark, the chair of the JLM, responded by saying that he “had the privilege of meeting Del Singh on a number of occasions at Labour Party meetings and events. “Whilst we clearly had different perspectives on elements of the Middle East conflict we also had much in common on both this and other issues, including commitment to human rights, equality and social justice. Del always talked about the importance of listening to narratives other than our own. “It is in that spirit that we are proud to have received this award. I have communicated this to Del's family and very much hope to have the opportunity to meet with them in due course. " In fairness to the most notorious liar in the Zionist movement (a lot of competition, I know) that tweet was 2 days ago but now the conference is over the family is still awaiting answers as to how the supporters of the last of the colonial settler states received an award in the name of one of the founders of Labour Friends of Palestine. All very sad for the family for now but I do believe the award will quietly or noisily be taken away from the Zionist enemy within the Labour movement. Oops, an apology. I had said in the first para that the inaugural meeting of Jewish Voice for Labour attracted the false allegation of Holocaust denial. It was actually Free Speech on Israel. Wow, a video clip of a non-Zionist Jewish Labour Party activist, Leah Levane, has made it to the Telegraph Facebook page without the obligatory false allegation of antisemitism in the comment underneath. Don't accuse people of anti-Semitism when they criticise Israel, Leah Levane urged during the Labour Party conference. So there we have it. A fairly standard Zionist smear. It's sad that the busting of it had to be released before the Labour Conference was even over but since Jeremy Corbyn did so well in the general election the opportunists in the Labour Party, who thought he was an electoral liability, have gone to ground leaving the smearing to Blairites and Zionists. It's my guess that after the conference has ended, we'll be hearing more in the mainstream media about antisemitism than we'll be hearing about socialist Labour Party policies. There's no case for Israel and no case for austerity and antisemitism smears are their only tactic. The antisemitism smear campaign against Corbyn and the left has been given such prominence in the media many people will not have noticed that Corbyn and his advisers have pandered to the Zionist movement at every turn in order to make them stop the smearing and start campaigning for a Labour victory. I won't list out the twists and turns so far but the latest has involved Jeremy Corbyn granting the Del Singh Memorial Award to the Jewish Labour Movement, the prime movers behind the smear campaign. Del was a true champion of human rights; he was and remains a source of inspiration to many people, in his fight against injustice and aparthied. The family point out that it is not just the irony of Singh's involvement with Labour Friends of Palestine that makes this award to Zionists remarkable, it is the fact that he was actually banned from Palestine because of his anti-racism and support for human rights. Many of Jeremy Corbyn's compromises with the Zionist movement can be worked around and have gone largely unnoticed by the public and unthanked by the Zionist movement. This compromise too far will have to be different. Del Singh's family have been hurt by this and Corbyn needs to put it right, preferably before the Labour Party Conference 2017 is over. Naomi Wimborne-Idrissi helping to restore Labour's credibility as an ant-racist internationalist party after many recent betrayals of the Palestinian cause and its supporters since Jeremy Corbyn came under attack from Blairites and the Zionist movement upon becoming Labour leader. Naomi: Thank you, thank you Chair. My name is Naomi Wimborne-Idrissi. Despite my grey hairs I am a virgin in terms of the Conference, first-time delegate, hooray. I'm from Chingford & Woodford Green, the newly marginal constituency, where we are going to unseat Iain Duncan Smith. [loud cheers and applause] Thank you, but don't take up too much of my three minutes. Come and help us bring about a sweet Portillo moment, when the time comes. Now, I'm here today because although I care deeply about Brexit and the debate has been excellent in some respects, I want to welcome the insertion into the NPF Annual Report section on the Middle East of the key paragraph from our ground-breaking Manifesto which referred to Israel's occupation and settlement of Palestinian land [cheers and applause]. I am so pleased that this section has been put back in after being inexplicably omitted from the NPF Report. Let me tell you my perspective on this. I'm Jewish; I come from the tradition of anti-racist and anti-colonialist struggle, a Socialist Labour tradition of international solidarity with oppressed people. [applause] This is not some meaningless David Sparks slogan out of the pages of Private Eye. It's a fundamental feature of our traditions as a party committed to justice and equality. Oppression and discrimination are rampant in today's world. So why Palestine? Well it's not only that this year marks 50 years of Israeli occupation and illegal settlement. It's not only that this year marks 10 years of the siege of Gaza with intermittent military onslaughts against its people. This year also marks 100 years since the Balfour Declaration, when a British foreign secretary promised the land of Palestine to the Jewish people, my people. The civil rights of the existing population, that's the Palestinians, were meant to be protected, but that turned out to be an empty promise. We Brits, all of us, have a responsibility for what occurred. Despite huge misgivings and even outright opposition from many Jews, our leaders, British leaders, facilitated founding a state which privileges Jews such as myself over non-Jews. [applause] Thank you. I've only got half a minute. Seventy years ago, 750,000 Palestinians were driven from their homes in what for them was a catastrophe, that they call the Nakba. More than 450 towns and villages were destroyed, the world's longest-running refugee population was created. We Brits need to take responsibility for the on-going Palestinian tragedy dating from Balfour's pledge. The section of the Labour Party Conference 2017 that Naomi addressed was titled something like BREXIT and Internationalism. Apparently Naomi waved a banner identifying her (and Ian Duncan-Smith's) Chingford & Woodford Green constituency and it caught the Chair's eye and she was called to speak almost by chance. And what a speech! She covered most of the main points. She covered how a manifesto pledge on Palestine disappeared and reappeared. she mentioned the key anniversaries, Gaza blockade: 10 years, occupation: 50 years, Balfour: 100 years, Nakba: 70 years and, it shouldn't have needed saying but she made it clear that the Labour Party does not have a problem with Jews. And it is just possible that her speech was the only one for Palestine that was main event and not fringe. So what next? I'm guessing Labour Zionist leader, Jeremy Newmark, will take the opportunity to reprise his disgraceful attempt to close down discussion of Israel/Palestine at the University and College. So let's just see if the so-called Jewish Labour Movement tries to prevent a situation where random activists can be called to speak for internationalism at the Internationalism section of the Labour Party Conference 2018. I'm going to post articles I find arising out of the old Ronnie Fraser vs University and College Union (FUCU) case where Zionists actually had the decency to be embarrassed over a scathing ruling where some of the UK's leading Zionists tried to make out that Palestine solidarity activism amounted to antisemitic or racial harassment of those Jews (in this case Ronnie Fraser) who support The State of Israel. One reason for doing so is that they lift the spirits in troubled times and another is that the former critics seem to change their minds and their own old articles get harder to find. In this case I've already posted the article before but I want them in roughly one place. Sometimes we need an outsider’s perspective to bring into focus uncomfortable truths about ourselves. Just before the Passover festivities, the Employment Tribunal released a 45-page judgment full of Biblical fury which did just that. The judgment was about a legal claim brought by a maths teacher, Ronnie Fraser, against his teaching union. He claimed that the Union had harassed him in breach of equality laws due to its handling of the Israel-Palestine debate. Let’s just step back for a moment. Just because a judge rules on something doesn’t mean they are right. Judgments get appealed and overturned. Reading this one, and not having been in court for the weeks of evidence, there are at least two possibilities. First, that the Tribunal has taken an irrational or perverse dislike to the claimant, his lawyers and some of his witnesses – that is a real possibility, given how scathing the judgment is. The second is, however, is that the Tribunal has got it broadly right, having listened to the extensive evidence and nonetheless dismissed the case out of hand. As I said, I wasn’t there – this is an evidence heavy case so you really have to have sat through it to reach a proper conclusion. But assuming for the purpose of this article that the Tribunal did get it right, there is a lot here to be worried about. Let’s take just a single paragraph, number 148. Here the Judge is summarising his conclusions on the claimant’s witnesses who included British Jewish luminaries such as the author Howard Jacobson. Some gave “careful, thoughtful, courteous evidence”. Others however, “seemed more disposed to score points or play to the gallery rather than providing straightforward answers to the clear questions put to them.” Again, ouch. We regret to say that we have rejected as untrue the evidence of Ms Ashworth and Mr Newmark concerning the incident at the 2008 Congress… Evidence given to us about booing, jeering and harassing of Jewish speakers at Congress debates was also false, as truthful witnesses on the Claimant’s side accepted. One painfully ill-judged example of playing to the gallery was Mr Newmark’s preposterous claim, in answer to the suggestion in cross- examination that he had attempted to push his way into the 2008 meeting, that a ‘pushy Jew’ stereotype was being applied to him. The opinions of witnesses were not, of course, our concern and in most instances they were in any event unremarkable and certainly not unreasonable. One exception was a remark of Mr Newmark in the context of the academic boycott controversy in 2007 that the union was “no longer a fit arena for free speech”, a comment which we found not only extraordinarily arrogant but also disturbing. Wow. Here are some words you never want to hear in litigation: “untrue”, “false”, “preposterous”, “extraordinarily arrogant”, “disturbing”. To recap, this is the Chief Executive of an organisation which is arguably now the main ambassador of the Jewish Community to the wider British community. This may all be unfair and perverse, but if it is not then we should be worried about the implications. We did not derive assistance from the two Members of Parliament who appeared before us. Both gave glib evidence, appearing supremely confident of the rightness of their positions. For Dr MacShane, it seemed that all answers lay in the MacPherson Report (the effect of which he appeared to misunderstand). Mr Mann could manage without even that assistance. He told us that the leaders of the Respondents were at fault for the way in which they conducted debates but did not enlighten us as to what they were doing wrong or what they should be doing differently. He did not claim ever to have witnessed any Congress or other UCU meeting. And when it came to anti- Semitism in the context of debate about the Middle East, he announced, “It’s clear to me where the line is …” but unfortunately eschewed the opportunity to locate it for us. Both parliamentarians clearly enjoyed making speeches. Neither seemed at ease with the idea of being required to answer a question not to his liking. 157… The Respondents defended themselves courteously but robustly against treatment by the Parliamentary Committee the fairness of which was, to put it at its very lowest, open to question. The sarcasm drips off that final sentence, doesn’t it? Ultimately, the Tribunal concluded that contrary to the claimant’s arguments, the Union’s meetings were “well-ordered and balanced” and that almost the entire case was “manifestly unmeritorious”. Most importantly, the Tribunal rejected out of hand the argument that “a belief in the Zionist project or an attachment to Israel or any similar sentiment” can amount to a protected characteristic. Where does this leave us? 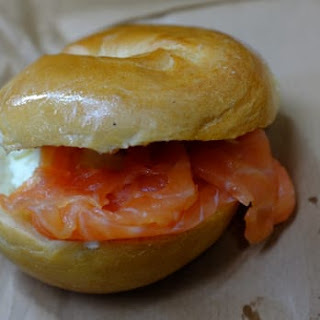 It is tempting to see this “sorry saga” as no more than an unfortunate and hubristic litigation fail, or an “act of epic folly” as the Jewish Chronicle’s ‘Ask the QC’ QC Jonathan Goldberg commented. But I think there are wider lessons here which we would ignore at our peril. Anyone who follows Jewish communal politics and reads the JC will recognise many in the cast of characters as well as the arguments. Anti-Zionist or pro-Palestinian campaigners are regularly branded as anti-Semites. Despite the good work of organisations like Yachad, this is still a regular and well-supported narrative at the centre of much of the Jewish communal response to criticism of Israel. But that approach – which really amounts to communal comfort food – has clearly failed. And yet it is still wheeled out: watch, for example, this stirring but flawed recent speech by the Chief Rabbi to AIPAC, an American pro-Israel lobby. They hate us, so they would say that. Etc. Of course, some criticism of Israel is linked to or motivated by anti-Semitism, but isn’t it time to stop using vast resources to paint legitimate debate as racial hatred? As well as failing miserably as an pro-Israel argument, this approach also risks fatally undermining work against real anti-Semitism. Aren’t we just a little bit ashamed for major communal leaders and organisations to have backed a claim showing a “disregard for pluralism, tolerance and freedom of expression”? It certainly did crystallise broader themes and issues. But not the ones the cheerleaders hoped for. As said above, it is possible that this Tribunal reached a perverse decision. No doubt some will say so once the recriminations begin to fly. I imagine some will even accuse the Judge of anti-Semitism. But assuming for a moment that he was right, we should, as a community, be embarrassed by this ruling. It involved not just the looney fringe but central figures in the community, who have been branded exaggerators, manipulators and arrogant liars. More importantly, the ‘anti-Zionism equals racism’ argument is plainly bankrupt and has no purchase in wider society. We should move on to something which might actually work. And that is the lesson of this sorry Passover saga. The Cartoon Kippah website linked in the headline is now gone. 1. Calling for, aiding, or justifying the killing or harming of Jews in the name of a radical ideology or an extremist view of religion. 2. Making mendacious, dehumanizing, demonizing, or stereotypical allegations about Jews as such or the power of Jews as collective — such as, especially but not exclusively, the myth about a world Jewish conspiracy or of Jews controlling the media, economy, government or other societal institutions. 3. Accusing Jews as a people of being responsible for real or imagined wrongdoing committed by a single Jewish person or group, or even for acts committed by non-Jews. 4. Denying the fact, scope, mechanisms (e.g. gas chambers) or intentionality of the genocide of the Jewish people at the hands of National Socialist Germany and its supporters and accomplices during World War II (the Holocaust). 5. Accusing the Jews as a people, or Israel as a state, of inventing or exaggerating the Holocaust. 6. Accusing Jewish citizens of being more loyal to Israel, or to the alleged priorities of Jews worldwide, than to the interests of their own nations. 7. Denying the Jewish people their right to self-determination, e.g., by claiming that the existence of a State of Israel is a racist endeavor. 8. Applying double standards by requiring of it a behavior not expected or demanded of any other democratic nation. 9. Using the symbols and images associated with classic antisemitism (e.g., claims of Jews killing Jesus or blood libel) to characterize Israel or Israelis. 10. Drawing comparisons of contemporary Israeli policy to that of the Nazis. 11. Holding Jews collectively responsible for actions of the state of Israel. Antisemitic acts are criminal when they are so defined by law (for example, denial of the Holocaust or distribution of antisemitic materials in some countries). Criminal acts are antisemitic when the targets of attacks, whether they are people or property – such as buildings, schools, places of worship and cemeteries – are selected because they are, or are perceived to be, Jewish or linked to Jews. Antisemitic discrimination is the denial to Jews of opportunities or services available to others and is illegal in many countries.